Coffee machines should make great coffee, it's what they are designed to do. Sadly, not all machines measure up to this basic function. The La Piccola Coffee Machines we provide do make great coffee as well as being great to look at and fun to use. and have parts readily available. These Coffee Machines take ESE coffee pods which take the guesswork out of having the right grind, the right dose and the correct level pressure when tamping the coffee in the group handle. 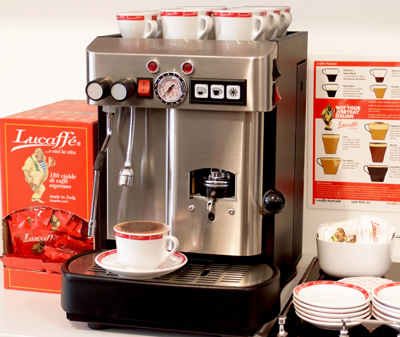 La Piccola commercial ESE coffee pod machines bring out your inner barista as every pour of espresso is exactly right. Perfect right down to the last drop of crema! The quest for a coffee solution for businesses is difficult and confusing. Lucaffe Italian coffee and La Piccola Italian coffee machines deliver a simple answer that ticks all the boxes for an office coffee machine, Fast and simple to use. Energy efficient and easy to clean. Very low maintenance and low mess. Lucaffe supplies coffee pod machines that take the fuss out of coffee and turns each member of your family into a barista. Explore the delights of Lucaffe coffee with your friends and family through our 11 different coffee blends, single origin and flavours. There is a coffee to suit everyone. 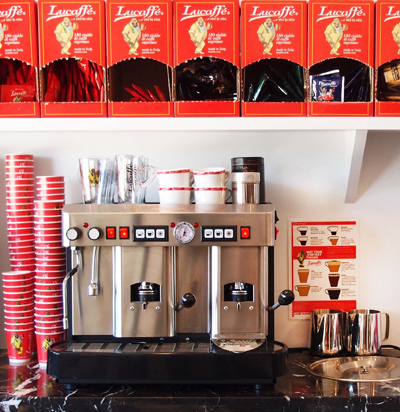 No matter how big or small your restaurant or business is Lucaffe has a solution for you. 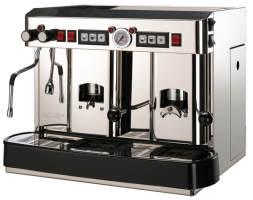 La Piccola “Cecilia” machines deliver excellent authentic Italian coffee, fast, clean, and exactly the same by each operator. The La Piccola "Cecilia" simplifies coffee making and produces superb espresso without mess or fuss in under a minute. Lucaffe supply the ese coffee pods, compressed discs of coffee covered in a permeable food grade paper. They are simple, fresh, clean, the perfect Italian espresso. The Cecilia takes the guesswork out of making espresso. Speed, cleanliness, and easy maintenance means faster coffees and more turnover. Fresh Lucaffe coffee pods are the perfect partner for the Cecilia. Our customers are amazed that they can have coffee this good in their business. Coffee should be extracted at exactly the right temperature, around 92°c. Each group head in La Piccola Coffee machines is separate so every coffee is extracted at exactly the right temperature always. Some coffee machines use the same heat source for coffee and steam for milk. The problem with this is that steam is made at 100°+ in a boiler so the coffee you make could possibly be burnt, but not in a La Piccola Italian coffee machine. Italy is the spiritual home of coffee and coffee machines. Continuous innovation since the first espresso machine was created in 1901 has lead to the creation of the easy serve espresso (ese) coffee pod, or as they call it in Italy, cialde (pronounced “chee-al-day”). La Piccola is Italy’s leading ese coffee pod machine manufacturer producing the Cecilia range for restaurants and businesses as well as the Sara, Bat and Piccola Piccola machines for small business, catering or home. Maintaining and looking after a quality coffee machine should be easy to understand and to do. Below are our PDFs for all relevant care and maintenance information relating to our La Piccola Coffee Machines.